As a statement piece, my bright, highly decorative 'Charm of Hummingbird' print is the perfect choice. Applied to a cushion this enchanting exotic bird comes to life in our home. As a gift or to add to your own interior – the intensity of the turquoise and blues combined with the detail in pattern, is an eye-catching combination! This stunningly colourful cushion displays the exotic hummingbird in a frame of pattern. A floral cascade in tones of blue, turquoise and green attracts this charm of hummingbirds. The ombre tones of colour form amazing decorative patterned wings, which flutter as they hover to feed. This scene is brought to life on a black square background, showcased in a frame of stylized geometric borders surrounded by a bright turquoise ground. The design is printed on one side of the cushion on a cotton based fabric with a coordinating turquoise fabric on the reverse side. There is simple zip opening on one side for easy cleaning. For maximum comfort this has a duck feather inner pad made in Britain. The cushion size is 400 x 400mm. I am Lesley Rudman Stevens and, with the help of family members I run a small design business called Decorque in Oxfordshire. I design everything from my home studio; including placemats, coasters, art prints, greetings cards, lampshades and cushions – a few of which I actually make myself. As a textile designer, I started my creative path in the fashion industry, but in the past couple of years I have turned my design focus to pattern design for home accessories and gifts, selling directly to you the customer. I like to think that I have brought a fresh look to an eco-friendly material – cork. Having my designs printed digitally, with such intricate detail and range of colour, is quite a new concept. Read more about me and Decorque here. 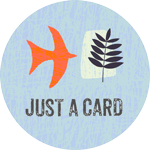 I'm supporting the Just a Card campaign. All designs and concepts on this site are strictly Copyright © Decorque Limited 2012-2017. All rights reserved.